Located between half an hour and 1.5 hours north of Sault Ste. Marie adjacent to highway 17 this area hosts over 10 separate ice climbing areas. 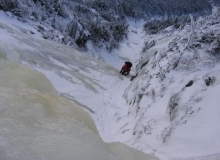 In the area just south of Lake Superior Park in the vicinity of Montreal River Harbour are several easily accessible Ice climbing sites. Tower Road hosts over 30 short but steep ice climbs up to 10 meters in height. The road is plowed all winter so one can park a vehicle within 20 meters of the climbs. Just a few minutes north short hikes of 15 minutes from highway 17 take climbers to the Panama Wall where there are 6 climbs up to 25 meters in height the most interesting of these is Aurora Borealis grade 4, 20 meters. Across the highway is the Ryall Wall, on which is found the spectacular “Mother of Pearl” a grade 3+ ice climb 20 meters in height. 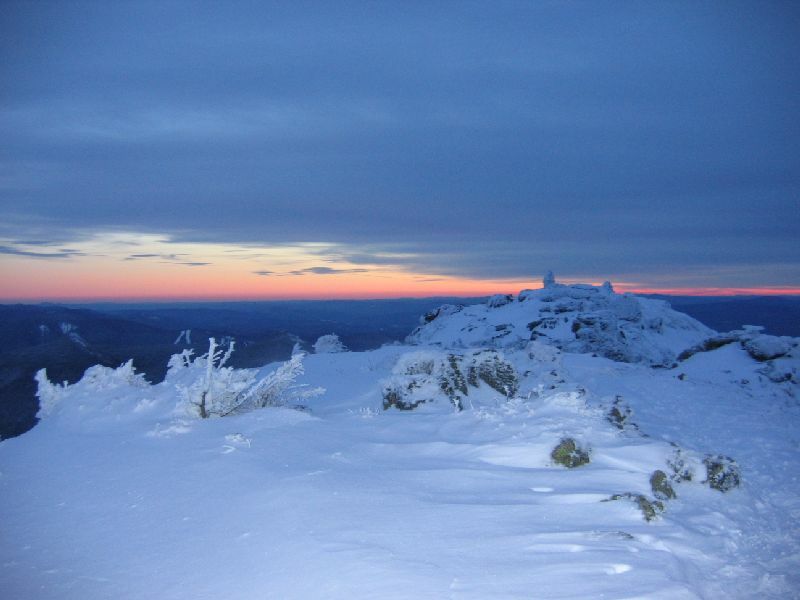 For the more adventurous one can snowshoe or ski along Ranwick Road for 4 kilometers to Ranwick Rock, the site of summer rock climbing activities and a rock climbing guidebook. 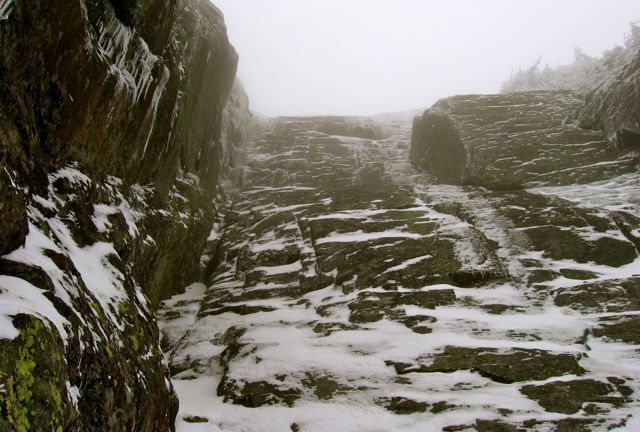 In the winter there are 8 ice climbs up to 100 meters in length. The access point for Ranwick is at the top of the Montreal River hill. One area, which has received considerable attention in the past and should see complete development this season, is Cerro-De-Hielo (Mountain of Ice). Located 8 kilometers off highway 17 on the Carp River road at Batchawana. This area contains several individual climbing areas including the Transverse Mercator wall hosting THRESHOLD OF AQUAINTANCE Gr.4, 25 M. The Wall of Deception contains two excellent climbs JACOB’S LADDER Gr.4+, 30 M, and VERTIGO VENTANA a series of blue pillars and curtains rated Gr.4, 30 M high. The Wall of Sinn and the Wall of Sorrow shows promise for a minimum of 25 climbs of 20 meters in height and all in the Gr.4 to 5 ranges. The access road is supposed to be open all winter 2005 as logging is taking place in this area. The Climbs of Mile 38 Road near the well know Chippewa Falls on highway 17 offers many enticing climbs. Located 4 kilometers down this plowed road from highway 17 the climb “BLUE AVENJURE” 100 M, Gr.3, saw 5 ascents by different parties within the first three days of its first ascent in 2002. 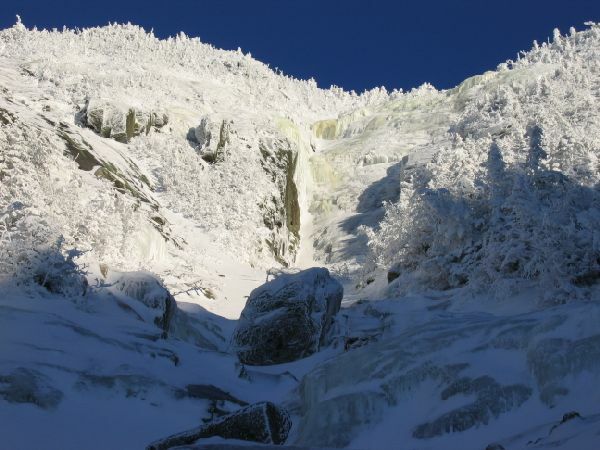 It is one of the highest and most accessible ice climbs in the east shore of Lake Superior. The climb DUTCH TREAT Gr.4+, 50 M lies less then 150 meters from where vehicles are parked on Mile 38 road and gives two variations of climbing, one in a chimney choked with ice or a direct headwall. “Superior Ice” guidebook in 2001 by Granite publishing many more climbers have taken an interest in this well known canyon located north of Sault Ste. Marie. Agawa Canyon has 54 climbs up to 200 meters in length along the 6 miles of canyon between mile 110 and 116. Climbers can enjoy the Algoma Central Railway passenger train service that will drop passengers off to enjoy winter camping at Mile 112 in the center of it all. 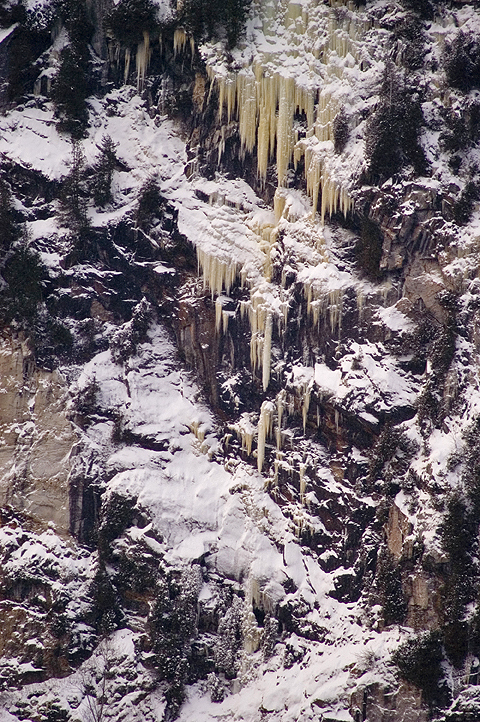 Ice climbers have during the winter of 2004 found access points to Agawa Canyon by snowmobile from the Frater Road. This access trail takes one to the edge of Agawa Canyon at Mile 110. Two new areas have been developed in this area, the “ONLY 17 WALL” and the “LIL-AGAWA CANYON” adds another 15 ice climbs to the area with routes up to 50 meters in length. The 2nd edition of the Agawa Canyon Ice climbing guidebook will be available in early 2005, and will include these new areas. The second area mentioned in the “Superior Ice” guide, Montreal River (South Bay) at Mile 92 on the Algoma Central Railway has 10 climbs up 130 meters in length along a 1.2-kilometer wall of pristine granite. The favorite climb in this area is Comfortably Numb Gr.3+, 120 meters at Mile 92 (South Bay). One can access this are either by train or by snow machine. A Reconnaissance expedition by snowmobile in January of 2004 up the Montreal River uncovered the SPK, Majestic and Mystic Walls. This face of granite is in excess of 4 kilometers long, and hosts what appears to be the Mid-Continents highest and most aesthetic ice climbs. 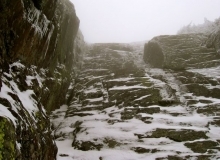 The highest ice climb in the Mid-continent “STRATOSPHERE Gr.4, 260 meters is found here. Along the same face is the route RITE OF PASSAGE Gr. 4, 160 meters in length is an ice filled fault line. The TURQUISE COYOTE Gr.4, 70 meters and its upper section the EMERALD BOBCAT Gr.4, 50 Meters contain the largest mass of ice in the region. The main danger of accessing these climbs is the Montreal River Reservoir, which seldom freezes, and offers many large expanses of slush and open water throughout the winter months. Several snowmobiles were abandoned last winter in the slush, and one snowmobile went through the ice in the winter of 2003, but was rescued 10 minute later, loosing the machine. This area is quickly gaining the reputation as a climbing destination for ice climbers in the Midwest and throughout North America, the height and aesthetic value of the climbs. The local guidebook “Ice Climbs of The Batchawana-Montreal River Harbor areas is now in it’s fourth edition. 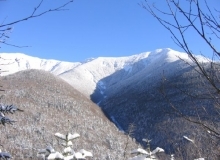 It includes the climbs of the Montreal River Harbor Area, Cerro-De-Hielo and Mile 38 road. A fifth edition is due out in February 2005, and will contain over 100 ice climbs in 14 separate areas. 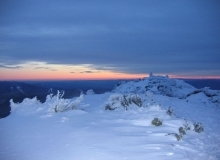 Photos, ice conditions, route information is posted frequently on www.climbingcentral.com in Rumor Central. I have often looked over and speculated on what the climbing on Mt. Lincoln might be like. Fred Bieber and I went to find out. We were not disappointed. Take 93 North to Franconia Notch. Park at the trail head parking just after the Basin parking or at the Lafayette Camp Ground. 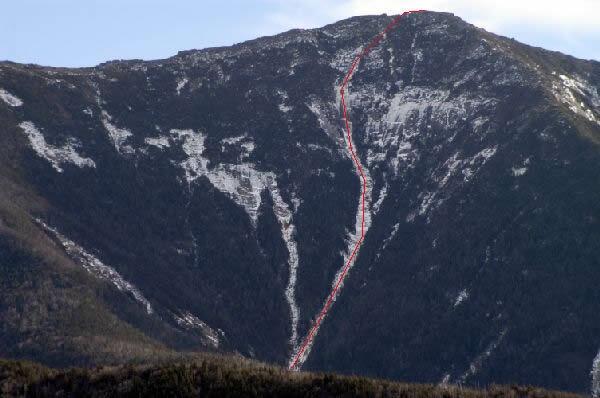 Hike the Old Bridal Path till you are in line with the gully (see 1st photo). Bush wack down through thick spruce to the brook. Cross the brook and head up the right drainage. Follow this drainage till you hit the basin then take the right drainage to the summit. Follow the ridge trail right to Haystack Mt. and descend the Falling Waters trail. It’s about 9 miles round trip. Early winter before the snow get too deep. The gullies are subject to avalanche danger, be careful. How much climbing can I expect to actually get in? About one pitch of WI3 ice. If you are looking for lots of ice, this is the wrong climb. 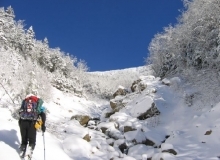 This climb is about getting away from the crowds and climbing a mountain. Absolutely! No trail, road traffic or other climbers. I felt like I was walking up some big drainage out west. Great views all day and you top out at 5000 ft. A great leg work out and a great adventure. This is a remote climb so act accordingly. Enjoy!